It is a dark time in the Empire. The troubles of the Chaos Incursion left the north a smoking ruin, a bleak land infested with roving bands of Beastmen, a wellspring for the Chaos cults and their efforts to turn honest men and women into gibbering slaves of darkness. Such horrors breed sorrow and fear and common folk huddle in the shadows cast by the far-flung north, searching for salvation from the gods, heroes or from anyone with the courage to reclaim their devastated land. A hero has come, but little did people expect he would be a young man from the wasteland. 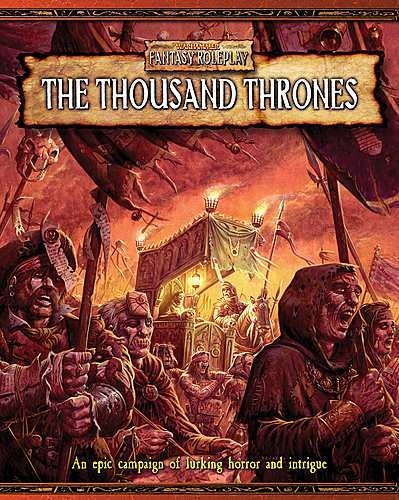 The Thousand Thrones is a campaign for Warhammer Fantasy Roleplay, promising to take adventurers from the stinking canals of Marienburg to the western fringes of Kislev. When a boy with a burning twin-tailed comet on his chest single-handedly kills a pair of cultists, he is proclaimed to be Sigmar reborn. Supported by a legion of fanatical followers, the player characters are drawn into a dangerous and sinister story involving ancient evil, the cults of Chaos, the lords of night and a veritable army of other deadly foes. Inside this adventure sourcebook you’ll find nine adventures combining into an epic adventure. Whether used as stand-alone adventures or as a complete campaign, The Thousand Thrones promises months of exciting action and investigation, loaded with compelling characters, strange environments, and deadly secrets that are certain to take the heroes over the brink of madness and beyond! 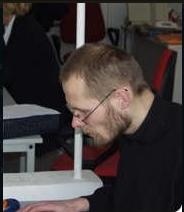 Szkoda tylko że nie wydali po polsku, angielski nie stanowi dla mnie problemu, ale jakoś wolę nasz piękny język ojczysty.